How many of you remember Close Encounters of the Third Kind from the 1970’s? It was a popular science-fiction movie written and directed by Steven Spielberg about a utility line worker who had an encounter with a UFO and was obsessed by visions and 5 musical notes. His obsession led him in a path to an extraordinary discovery in the end. You’ll have to see the movie to see how it plays out—I don’t want to spoil it for you. How does this relate to home improvement? This time of year, we all become obsessed with updating our home. Do you find yourself obsessing over visions of new cabinets, countertops, tile, flooring or a pretty splash of color for your kitchen, bathroom or bedroom? We’re bombarded with social media, newspapers, and advertisements about the latest and greatest ideas in home improvements. It is definitely the season to start those projects and if you’re like most homeowners, completing those projects is a priority. So . . . where do you start? My husband and I usually try to tackle projects from a DIY standpoint because it can be more economical. However, we’ve had to rethink a few of them when we realize we are probably getting in over our heads. That’s when we decide to get help from a professional. Some projects are small and definitely labeled “DIY” while other projects are more complicated and require a greater financial investment AND a pro to complete the job. Here are some steps to consider when making the most of your home improvement projects. Decide what you want to do and have a plan. Figure out what the end result is and have a clear vision of what it should be. This is not the time to “fly by the seat of your pants.” You’ll end up making bad decisions and it will cost you. Be detailed, be precise. You can estimate the costs and stay on track with your remodeling budget if you know the scope of the project. Make sure you are creditworthy. If you are completing a large project that requires a loan, you’ll want to have your financial house in order. Check your credit score and know what’s on your credit report. Understand your credit status so that the loan process goes smoothly. It will make you a savvier loan applicant when you apply and you’ll also know what to expect regarding the details and terms of the loan. Decide to be a DIYer or hire a professional. Can you actually do the project or is it beyond your DIY capabilities? If it is, you probably need to hire a professional. Being a DIYer can save you money, but only if it’s done right the FIRST time. If you have to fix a mistake, it may end up costing you more in the long run than if you hired a professional in the first place. Hire a reputable contractor. Most home improvement contractors are honest because their reputation depends on it, but do I need to remind you about the scams we often see caught on hidden camera with Dateline’s Chris Hansen on NBC? Don’t do business with just anyone. Check out your resources. Your contractor should have no problem giving you references so you can speak with these past customers also. If the contractor you’re considering hesitates to give you references, that’s clearly a red flag. Walk away and consider a different contractor. Seek contractors and companies who are licensed and bonded. Make a budget and stick to it. Talk to your contractor and make sure he understands the need to stay on track and within budget. Any good contractor will want to stay within your budget. Their reputation is at stake. After all, they want to provide you with quality workmanship and balance cost constraints. It’s their bread and butter. They don’t want to see cost overruns any more than you do. Make sure you allow a little cushion in your budget for the unforeseen. So, go ahead . 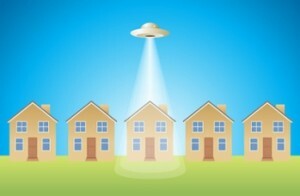 . . have a “close encounter” of the home improvement kind . . . make your house a home that’s more enjoyable to live in. You’ll not only enjoy the new look, but you’ll also reap the reward of increased home value.